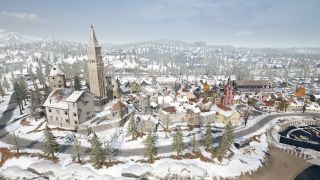 Vikendi is the latest map to be added to PUBG, and it’s the fourth in total. While we’ve had two large 8x8km maps with Erangel and Miramar, the third PUBG map to release was Sanhok, which was incredibly small at 4x4km. Vikendi fits right between them, at 6x6km in total, and it is absolutely covered in snow from top to bottom. Well, the southern areas are a little drier but you better wrap up, because even if you don’t emerge victorious, you don’t want to die and be freezing cold, do you? If you want to know the best places to drop on Vikendi, pay attention to this PUBG Vikendi map guide. First up in the best places to drop in Vikendi is Goroka. This is one of four major towns on the map, but Goroka stands out due to the verticality. You’re going to want to land at one of the buildings on the northern side next to the main road running through, because you’ll have the vertical advantage over any other players landing at the buildings below. In terms of loot, it’s the same as with any big city; go through a few buildings and you’ll likely have enough gear to last you until the end of the game, with assault rifles and attachments littering the floor. It’s also fairly central, so you should have safe refuge for the first few safe zones before you have to make your way out of the city. Just try not to get caught crossing the enormous frozen lake! One of the southernmost locations, the Winery can be found right next to Pilnec. You need to be careful because players will often loot up at Pilnec then come searching for kills at the Winery, but as long as you pay attention to the sounds around you, you’ll be able to hear footsteps from some distance away. As for loot, the main selling point about the Winery are the wine cellars found underneath some of the top-level sheds. These will often have a lot of solid loot, though players can be found camping down there so be on your guard. Pre-aim corners as you move around and you shouldn’t run into too many problems, as long as you take your time and don’t run willy nilly across the open areas. One of the most iconic locations on the map, the Cosmodrome is as you’d expect; an old abandoned spaceport. Around the rocket launch site has some very wide open areas, but if you stick to some of the single storey buildings away from the rocket site, you’ll find that almost all of them have underground areas with plenty of loot. You’re going to want to treat the Cosmodrome in a similar way to the Winery; treat each corner as if someone is waiting around it, and proceed cautiously. You can get a serious amount of loot here, but the surrounding areas can be a pain to run through when the blue is advancing so make sure you leave with plenty of time to spare. This one isn’t advised if your goal is to camp until the end of the game, but Castle is absolutely the best drop if you want to engage with other players and practice your skills in combat scenarios. It’s the most popular place on the map and also the coolest - it’s even got a river that doubles as a moat! If you manage to land at Castle and grab a decent weapon from the start, you want to be checking every single corner. The layout means there’s plenty of corners for other players to be sat behind, but if you are one of the few survivors here and you have a gun with a long range scope, head up to the highest walkway for a solid lookout spot. Like the Cosmodrome though, you’re going to want to vamoose with plenty of time to spare because there’s nothing worse than swimming across the moat with the blue chomping at your heels. If you’re playing solos, landing at the Lumber Yard is a good option for some isolation. There’s not a lot to say about this place; it has a few large open sheds with loot littering the floor, and you won’t find many other people landing here with you. If you don’t have enough stuff from the main Lumber Yard, there are multiple clusters of buildings all around, so you should have no problem getting over to them in peace. Our only word of warning is if you have a very western safe zone. The closest path into the circle will be across one of the only bridges that leads to the Castle, so there’s a good chance you’ll be a sitting duck as you either run across the bridge or swim through the water. Keep an eye on the timer and as always, move early if you think you could get held at a choke point. In the south-east corner of the map, you’ll find the small town of Cantra. It’s a quaint village, but in our experience, it tends to have some of the best loot compared to the other smaller towns like Vihar or Krichas. We’d recommend landing at the church in the corner first, then after that, check out some of the smaller buildings. Once you’re done in the main town, the Hot Springs are also right around the corner if you have time before the blue catches you. Keep an eye on the incoming zone though, because you’re so far away from the centre of the map, you’ll have some light jogging to do. Another good location for solos and duos, the Villa is self-explanatory. There’s a big building - the villa - and a few smaller sheds around the courtyard. You’ll find numerous weapons and attachments in the main building, and there’s also a Dacia spawn point in one of the garages. The main selling point for the Villa is how centrally located it is. You’ll almost always be safe for at least the first two zones, then when you eventually do have to move, there are a lot of buildings and house clusters to dart between if someone has already nicked the car. Struggling to succeed in PUBG's desert? Check out our PUBG Miramar map guide.